We crossed the wide and crystal aquamarine Waptus River on a sturdy wooden bridge (you appreciate these more once you've crossed a few creeks without), then started our next long climb. The grey sky provided intermittent spitting rain but nothing serious by WA standards. We had resolved to improve our nutrition/fueling plan today in hopes of achieving our mileage goal with less mental stress, so we planned to stop at the first campsite, about 1400' into the ~2600' climb, for another snack break. We had increasingly good views of enormous Waptus Lake as we climbed. It isn't particularly scenic aside from its vastness but made a pretty sight on a day with low clouds. At our schdeduled stop we perched ourselves on a rocky knoll overlooking the valley and took off our socks & shoes, still wet from last night. We heard voices from around the corner and were surprised to see Ben & Sarah (Nuthatch), who had camped nearby and were just getting their day started. Ben completed a thru-hike of the AT just a week before starting his PCT hike, and both of them typically put in 30 mile days. Since they left Stevens Pass several hours before us we didn't expect to see them again in this stretch. It turns out they were "taking it easy" between Stevens & Snoqualmie Passes (their easy days equal our long days), and it was great to catch up with them. They said again how much they appreciated the fruit and cookies from Andrew's mum at Stevens Pass, and we exchanged details of our past few days. While we were talking a northbound section hiker came by and shared a weather forecast (clear after today) and trail conditions (plenty of blowdown in the lower elevations), then we all got up to hit the trail. As expected, Ben & Nuthatch were immediately out of sight and soon out of earshot. 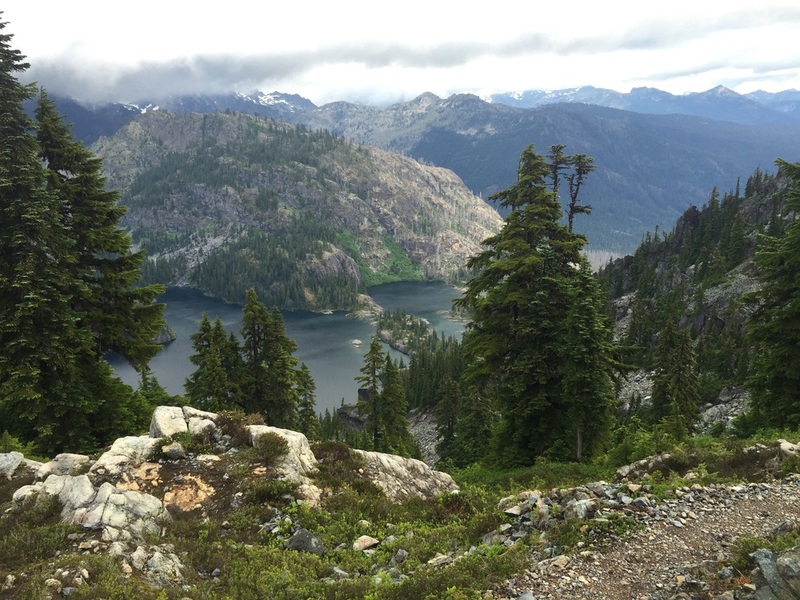 The remainder of the climb was straightforward, through alternating forested and rocky switchbacks with intermittent views of the lake and the opposite slope, though clouds covered the ridge lines and we couldn't see any peaks. The weather varied between brief periods of patchy sun, cool overcast skies with breezy wind, and spitting rain, but nothing serious enough to warrant a clothing change. 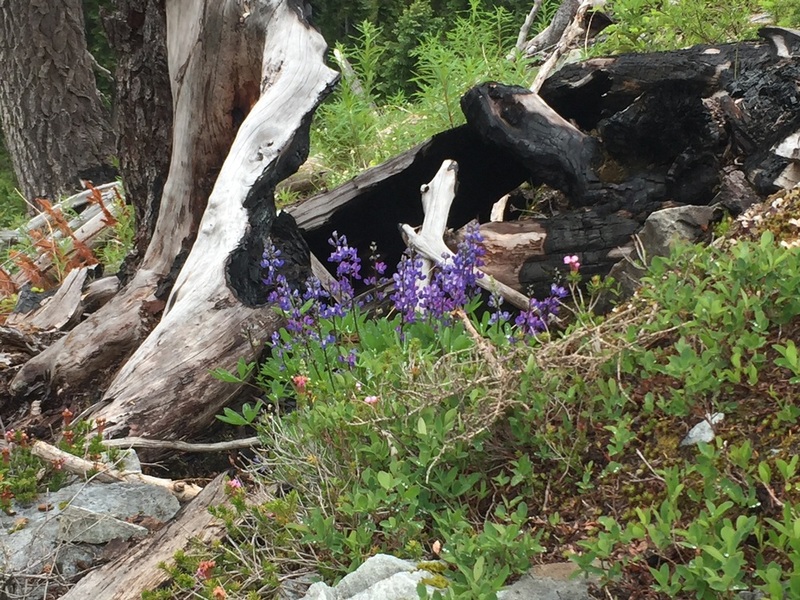 We took off our shoes & socks again while we had lunch at the top in a dry, rocky area with abundant sedum and lupine. From there, the trail contoured around the hillside staying right around 5400' in elevation through some pleasant little meadows and knolls. We expected to have more of the same until we started our descent then turned a corner and suddenly came into a series of interconnected alpine basins with several small but clear blue lakes, pink & white heather carpeting the ground, gnarled windswept trees, and mounds of dark rock breaking up the sight lines and providing a different vista around each turn of the trail. Swirling mist, low clouds, and persistent large snow patches only added to the drama of this sweet little spot that was unlike anything we'd seen so far on our journey (though reminiscent of some of our favorite spots in other mountain ranges). We were not surprised to see a sign indicating "Fragile Area Next 2 Miles, Please Camp Elsewhere" as it was clearly a magical place. Magical basin AKA "fragile area"
We remained at the same elevation around another shoulder and came into an old burn area that had its own stark beauty. The ground was carpeted in green except where snow persisted, and the bright white and char of the standing and downed snags contrasted strongly with the deep grey sky and intermittent sunlight. The predominant wildflowers were purple, with occasional rashes of bright yellow, and together all of the colors made a stunning sight. We affectionately named it the "ghost forest" and didn't mind at all stepping over several downed snags. 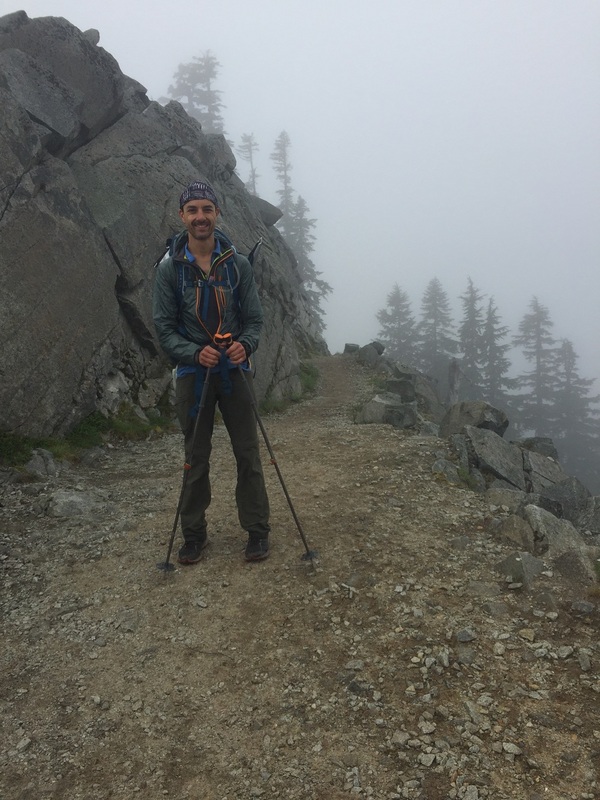 We ran into a father-son duo out for the Snoqualmie-Stevens section, and they echoed the sentiments of the previous hiker regarding blowdown and poor trail conditions in the valley below. The father went on to express his disgust that "they" couldn't do something about it, what with all of the "kids" out there. We chuckled, thinking it was something of a joke. He continued that all of the "troubled youth" should be "rounded up" and put to work on the trails for a month, that would straighten them out for sure. His son, probably 16-17 years old, rolled his eyes as if he's heard it before. We started our descent down the 3000' drop to the valley floor, initially through burn then through intact first. We passed isolated blowdown, and each time asked each other where are all the troubled youth?? It was no Methow River valley, but it definitely looked like a blowdown festival had come to Lemah and Delate Meadows. Only it was Hardly Strictly Blowdown as it also included wet, rutted, rocky, muddy trails overgrown with vegetation that prevented us from seeing our footing and soaked our lower halves once again. What can you say, it's Washington. Sigh. We are used to these conditions so we still made decent time in these next few miles and were happy to find Lord Vader's intel on the best crossing of large, rushing Lemah Creek (bridge washed out) to be right on. After yet another snack there, we started our climb with the 2.5 seemingly endless miles of switchbacks up overgrown, burned, blowdown-ridden, exposed hillside in the blowing light but steady rain to reach the bridge over massive Delate Creek. We would have been grumpy except that when we finally reached it, we found the most beautiful cascade of water coming straight down the hillside to the bridge. We stood there in awe of the water's power, and grateful for the bridge's existence. It was 5pm and we had less than 6 miles left to go. One last snack (our plan worked, our mental game was strong all day), then onward and upward for another few thousand feet elevation gain to our intended campsite. And our tent makes 5. Tent City, Park Lakes Basin on Night 17. We had the trail to ourselves for the rest of the evening, and had amazing views in swirling mist of the Three Queens, a hulking dark rock face to the south of the trail. As we climbed we also picked up a clear vantage point on deep blue Spectacle Lake to the north. The switchbacks were muddy with blowdowns in the lower section but quite civilized with beautiful alpine scenery as we climbed. The mist was cool but kept things visually interesting, and the rain stopped. Just before we crested the ridge we ran into a couple section-hiking WA northbound, just setting up their tent for the night. They had stayed at the Summit Inn the night before and confirmed that the forecast was for clear and sunny weather starting tomorrow for several days. We joked about how unlikely that really was, but they insisted that was the news. They also said they'd passed a group of 6 hikers about half an hour ago, which could only have been Ben & Nuthatch, and a group of 4 girls we'd heard about but not yet met. We pushed on into beautiful little Park Lakes Basin, just below the final climb to Chikamin Ridge that we'd leave for tomorrow. We arrived in camp just after 7pm, to find a small tent city of 4 solo tents already there. It was the girls (Old School, Clementine, Candy Cane, and another whose name I can't recall), who said hello through their tents and we chatted briefly. Ben & Nuthatch had been with them but pushed on further for the night. It started raining, so we cooked in the vestibule and ate in the tent. It was nice to be done and ready for bed before dark. Day 18 dawned clear and sunny, as predicted, on one side of the tent. On the other side, in the direction we'd be hiking, the mist was thick and low. Excited by the prospect of pancakes the girls were out and on-trail before 6:30am, while we stuck with our usual time of around 7. The first 4 miles were a rolling but generally ascending traverse along the middle contours of rocky Chickamin Ridge, likely spectacular in clear weather but all we could see was the rocky trail around us and a few ghostly tree silhouettes above and below. Those miles were otherworldly in the dense fog, which bordered on light rain. The rock transitioned from grey to green to purple to a deep jasper red, with occasional veins of quartz, and finally settled into the orange-red of iron. There were wildflowers but fairly sparse in this harsh and soilless environment. Despite the chill and difficult footing we enjoyed the drama of this section, and had it all to ourselves. 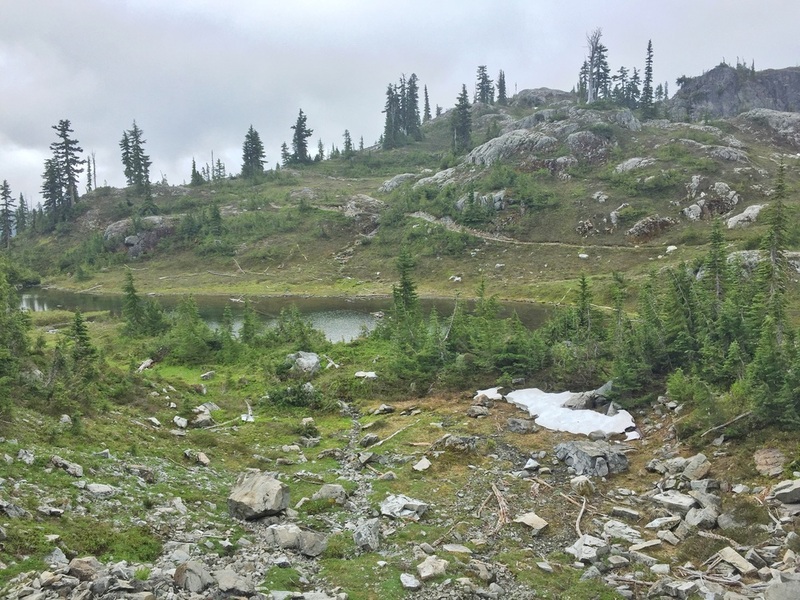 We contoured around the south side of Huckleberry Mountain (which we couldn't see), and noticed increasingly forested patches in this section and started to pick up views of large and deep blue Joe Lake below us, though it was sometimes obscured by mist. 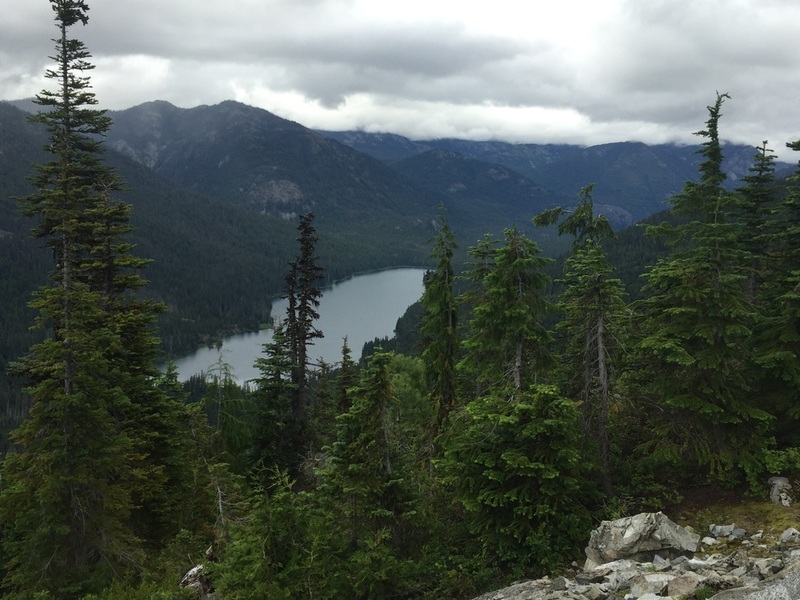 The trail nearly circled Joe Lake, then started to climb again and went around the shoulder of Alaska Mountain to provide views of similarly sized and deep blue Alaska Lake down below. By now the mist was rising higher and we had stunning views in this section of the steep rocky slopes down to the waters' edge, and the proliferation of wildflowers everywhere there was even a bit of soil. We caught up to and passed the girls in this area, and chatted briefly to find that they were not planning to overnight in Snoqualmie Pass. There are several campsites near smaller trailside Ridge and Gravel Lakes, and we suddenly started to see a proliferation of people coming out of the fog. We passed a troop of boyscouts, several backpackers, and an increasing number of trail runners as we neared Kendall Peak. We walked across the famous narrow "Kendall Catwalk" section in thick fog, so were unable to appreciate the drama of the sheer drop on both sides. 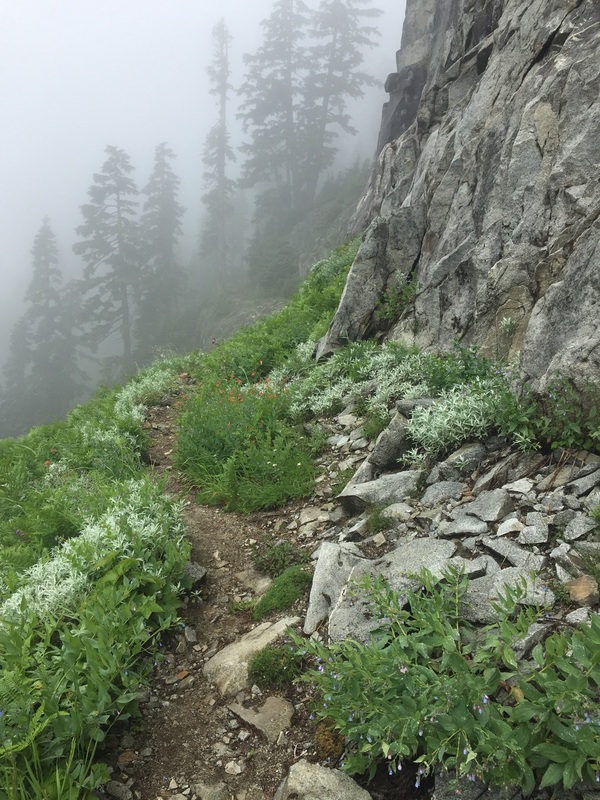 The trail held more of the same as we continued to descend in elevation - spectacular rocky slopes and more wildflowers than you could imagine, all draped in misty fog of variable thickness. Within 5 miles of the trailhead at Snoqualmie Pass we started to pass veritable mobs of people including backpackers, day hikers, dog walkers, etc. This must be the effect of a Saturday morning arrival at a popular trailhead in close proximity to Seattle, but it was a bit jarring to our senses after so many days in near-solitude. In any case, we were excited to reach civilization for showers, laundry, and a night indoors at the Summit Inn and made quick work of those final miles. Rainier Beer never tasted so good. Fish Tacos!! We had a 0.6 mile road-walk from the trailhead, under I-90, and along a wide and freshly paved road to the Inn. On the way we passed the large Chevron convenience store, and the Aardvark "food truck" (really a small building in the parking lot) out front. We'd heard only good things about Aardvark from many hikers on the trail but hadn't intended to have another mid-afternoon lunch. We stopped by to sign the trail register and the proprietor showed us to the patio and foisted two free beers on us. With a welcome like that, how could we leave? There were a handful of other SOBO thru-hikers there we hadn't yet met so we sat and socialized, and ordered a fish taco plate each. They were smothered in fresh mango salsa and may have been the best fish tacos I've ever eaten. Snoqualmie Pass, I think I love you. P.S. - Ben & Nuthatch stopped by Aardvark on their way out to the trail, headed south. The 4 girls came in as we were leaving and spent the afternoon there. Old School will head to Seattle to acquire some new shoes and the other three will press on today. 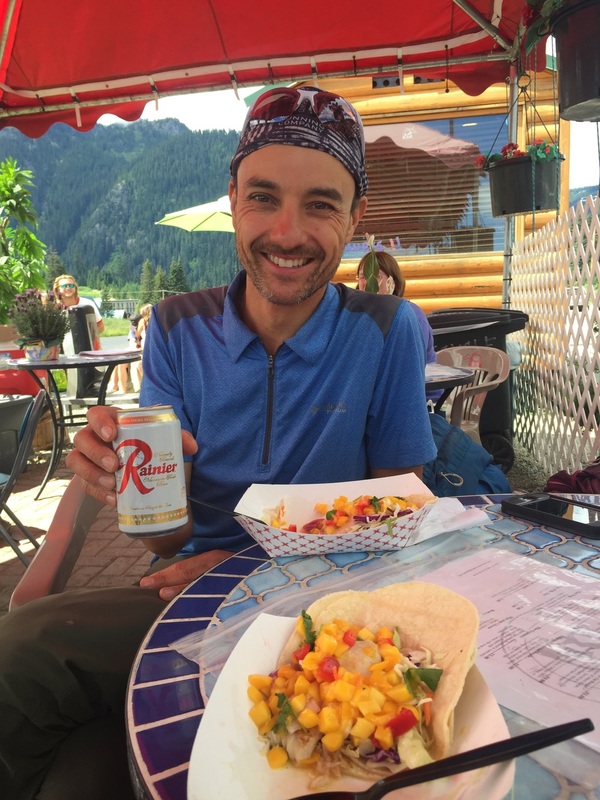 We are overnighting at the Summit Inn with a departure early tomorrow, to get in some decent mileage with a goal of meeting Andrew's family in a few days at White Pass. By the numbers: We have hiked 300 miles so far (including bonus miles), and are halfway through WA state based on PCT miles alone.